I just saw the poster above earlier this day and again I'm disappointed that the poster don't have any hint of Chun-li's Identity. Because of that I left home very pissed. 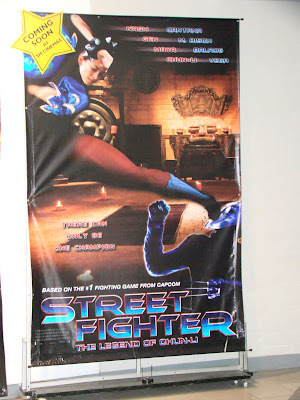 But as I was strolling the local mall here in the Philippines with some friends I bump in to this new poster of Street Fighter: Legend of Chun-li. We all jumped for joy because at last we saw what all Street Fighter fans wants to see. Chun-li's classic costume from Street Fighter II. At first the poster looks a little awkward and you can say that the poster is fake. But how come the mall's cinema is displaying it if it is not the movie's official Poster, right? So for now, we can all sleep soundly because we already know that there is a possibility that we can see Kristin Kreuk wear the original costume. I hope this is not a case of "only-in-posters" concepts because we will be gladly take time to hunt the poster's designer and burn him to crisp. This is good news. 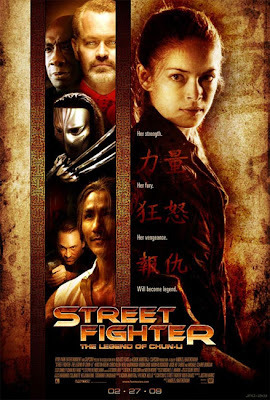 I have a feeling that the success of this movie will open the door to a "real" Street Fighter movie with Ryu, Ken, et al. Yeah I'm looking forward for upcoming Street Fighter movies.